HomeCare & Hospice of the Valley received $7,499.99 from Glenwood Springs Subaru and Subaru of America. Glenwood Springs Subaru selected HomeCare & Hospice of the Valley to be its 2015 charity partner for its “Share the Love” event. Subaru donated $250 to Hospice of the Valley for every new Subaru vehicle sold or leased through Dec. 31, 2015. Plus, Subaru of America and Glenwood Springs Subaru each made an additional donation. This is the eighth year for Subaru’s “Share the Love” national campaign. In 2014 this program provided more than $15 million in donations to charities across the country. HomeCare & Hospice of the Valley is nonprofit charity that provides end-of-life care to patients over a 6,000-square-mile service area stretching from Aspen to Parachute to Vail. The mission of HomeCare & Hospice of the Valley is to provide compassionate and dignified palliative and end of life care to patients and their families. For more information call (970) 930-6008 or visit info@hchotv.org. 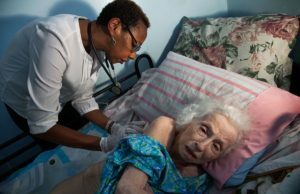 Funding will support the creation of a new community outreach program for people in Garfield, Eagle, and Pitkin Counties, a 6,000 square mile service area, to promote person-centered care and shared decision making by engaging and educating local health care professionals and residents in advance care planning. HomeCare & Hospice of the Valley will accomplish this goal by offering a series of 60 community meetings over two years for various constituencies (e.g. physicians, seniors, students, Hispanic Americans) led by a medical social worker, a nurse, a physician or a chaplain, depending on the audience. The mission of HomeCare & Hospice of the Valley is, “to provide compassionate, dignified palliative and end-of-life care to patients and their families, and to support families and their loved ones with peace, comfort and dignity.” HomeCare & Hospice of the Valley offers hospice, home health, palliative, bereavement and private duty services to patients in their homes, assisted living an nursing home facilities. They are the only Medicare/Medicaid certified hospice agency in Pitkin, Eagle and Garfield counties. HomeCare & Hospice of the Valley is a 501(c)(3) nonprofit corporation. For more information, please visit www.hchotv.org. The Colorado Health Foundation works to make Colorado the healthiest state in the nation by ensuring that all Colorado kids are fit and healthy and that all Coloradans achieve stable, affordable and adequate health coverage to improve their health with support from a network of primary health care and community services. To advance our mission, the Foundation engages the community through grant making, public policy and advocacy, private sector engagement, strategic communications, evaluation for learning and assessment and by operating primary care residency training programs. For more information, please visit www.ColoradoHealth.org. The May/June 2016 issue of Roots is out. You can download an electronic copy here. HomeCare & Hospice of the Valley announced today they have received a $100,000 Daniels Fund grant to support the Palliative Care for Colorado’s Western Slope. The mission of HomeCare & Hospice of the Valley is to provide compassionate and dignified palliative and end of life care to patients and their families. “The Daniels Fund is a wonderful philanthropic organization and we greatly appreciate their support and their very generous grant,” stated Markey Butler, HomeCare & Hospice of the Valley Executive Director. In addition to caring for our patients, our mission is to support families and their loved ones with peace, comfort, and dignity. HomeCare & Hospice of the Valley is a 501(c)(3) nonprofit corporation. For more information call (970) 930-6008 or visit info@hchotv.org. HomeCare and Hospice of the Valley (HCHOTV) is proud to announce the arrival of Roots, the bi-monthly grief and bereavement newsletter. Grief is one of the hardest things we experience as humans. Many metaphors are used in the description of loss. Grief is like a tidal wave crashing over our heads. At times the wave can suffocate us, taking our breath away; but at other moments the waves gently lap at our feet. A root metaphor is an image, narrative or fact that shapes an individual’s perception of the world and understanding of reality. Much like a root metaphor, the process of bereavement, grief and mourning is the attempt to accept our new reality. Many times after a death our sense of what is right and what is wrong in the world is shattered. Bereavement represents the state of loss as a fact that someone we love has died. Our grief is the internal response we experience physically, affectively, cognitively, behaviorally and spiritually. Our grief is how we react to the fact that someone has died. When we mourn we outwardly or publicly express loss through ritual and cultural practices. Many times we process grief and bereavement through sharing our stories. Our hope is that Roots will offer helpful articles and suggestions in your time of loss. We grieve so heavily because we loved so much. Even in the most complicated relationships, we grieve. May this newsletter offer some guidance and support to you and your loved ones. December 2 – The Little Nell – Aspen – 5:30 p.m.
December 3 – Colorado Mountain College – Edwards – 5:30 p.m.
December 8 – The Viceroy – Snowmass Village – 5:30 p.m.
December 9 – Valley View Hospital – Glenwood Springs – 5:30 p.m.
December 10 – Grand River Health District – Rifle – 5:30 p.m.